This story was told to me when I was a boy. Atie has several versions of this, but this is the one I remember. If only we could keep those precious moments of happiness! Oh how we wish for that. The strongest of these wishes come from the heart of one full of anxiety and pain. A small child was lost in the forest, alone and hungry. Even though the other kids made fun of it, she was proud of her name. Elobe, it was, and she was only nine. She didn't know which way to go or how far to travel. She walked on and on, and would have given up had it not been for a whispering voice which seemed to be calling her. It whispered her name; it gave her hope; it was her only friend. It was the voice of the trees. They called out to a kindred spirit. For, the trees in the blackened forest were also lost souls. A tremendous fire had raged through years earlier, killing so many and leaving those surviving slowly dying. An overwhelming wish for rebirth hung over the pine trees. Where the proud trees had once stood were now only weeds and moss; the air buzzed with insects. The girl had been crying again. She was desperate and could think of nothing that was happy. Then she came to the fire burned clearing. All around her were hundreds of colourful flowering spires. Big stars of pink and purple, shining with golden drops of honey on top of a rolled up tube were what she saw. Each little fireweed flower gave of a wonderful sweet smell which seemed to ease her hunger. She bent down to look at them more closely and was sure she could hear giggling. The pine trees had been so depressed that they had not thought of anything else but their sorrow. A moment of silence followed the little girl's gasp and the shout of "Christmas trees! Hundreds of them!". Suddenly the trees remembered that people revered them, especially at Christmas. The little flowering weeds were suddenly not pests taking over the forest, but symbols of happiness and rebirth. And, as the girl looked more closely, these plants were just like miniature Christmas trees. They were fully decorated in a ring of silver crosses, just below a cluster of eight golden balls. On top were pink and green candies. They were irresistible and the girl broke one off to taste it. Sweet and good it was, as the smell had promised, and so were the young willowy leaves. Then she saw the presents! On the bottom of the tiny Christmas trees were rows of rolled up packages. Some of them were already half open, showing shiny and soft insides. She couldn't help stroking the silky fluff and it flew off into the wind. The girl was sure she could hear giggling laughter, and a whispered " we will help you ". The rescuers came several hours later... tree planters on their way to re-forest the burn. They knew that the fluffy seeds would lead them to the fireweed first to grow in burned forests. 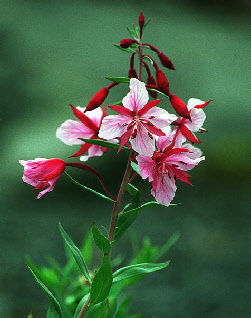 For Elobe, the fireweed was named Elobelium. Always it remains a symbol of strength and life; a child's wish that Christmas will last forever, even in the blackness.